The U.S. Department of Agriculture’s (USDA) National Institute of Food and Agriculture (NIFA) announced $11 million in available funding for projects that mitigate antimicrobial resistance (AMR), a growing public health issue that affects more than 2 million people annually. Funding is made through NIFA’s Agriculture and Food Research Initiative (AFRI), authorized by the 2014 Farm Bill. The AFRI Food Safety Challenge Area supports integrated research, education, and extension projects that address food safety challenges. The program seeks to empower transdisciplinary teams to develop, refine, and disseminate science-based knowledge about food and agricultural management and production practices that can reduce or eliminate the risk of AMR. The RFA also supports developing the knowledge, skills, and abilities of both current and future food scientists and members of the food safety workforce. Applications may only be submitted by eligible entities. Eligibility is linked to the project type (research, education or extension projects; integrated projects; or food and agricultural science enhancement grants). The deadline for applications is June 21, 2017. Among previously funded AMR projects, scientists at Kansas State University are working to find effective alternatives to antibiotics that are safe for use in modern swine and beef cattle production systems. 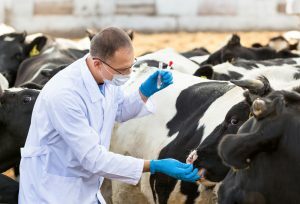 Colorado State University scientists are using DNA analysis to determine possible links between food animal production and AMR-related illness.